I have recently read a lovely book from Marion’s steadily diminishing library entitled Feed My Shepherds. The book, written by Flora Slossan Wuellner, explores the reasons why burnout is so common in ministers, suggests some ways to prevent this from happening, cope when you are in the throes of it, and ultimately heal. The author’s wisdom is well earned, having grown out of her own experience with the subject. 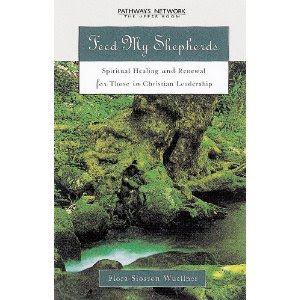 While I recommend the title highly, especially if you are experiencing spiritual or emotional fatigue, it is the book’s cover that I am thinking about this morning. The paper wrapper or “dust jacket” as it is known in the industry displays a picture of a very pastoral scene; a small stream moving past the gnarled roots and trunk of an old, moss covered tree. The stream brings life-sustaining moisture and nourishment in what otherwise might appear to be a barren and rocky place. It is a lovely image. I had adopted this delightful little book as part of my personal quiet time, reading a few pages or a chapter each morning for a couple of weeks. I had not thought much about the image or the cover until one morning when I happened to peal the jacket back to reveal the rather plain, imageless hard-cover book underneath. I realized then what a difference the cover made. It was the picture on the cover that caught my attention, intriguing me as a potential reader, suggesting the life-giving nourishment contained in the book’s interior. Without that dust jacket, it would have been just some paper elements with no suggestion of the rich message contained inside. Reflecting on that this morning, it occurs to me that this is not unlike our everyday experience in human life; one we probably do not spend much time thinking about. The various elements of the package we display outwardly to the world convey messages to those we encounter in our daily lives. For instance, a smile may suggest we are a pleasant, happy person that someone might enjoy talking to. A frown may suggest preoccupation or problems, conveying the impression that we may not be open to conversation. A scowl might simply say, “Keep away, I’m busy or annoyed or frustrated at the moment!” A smile in the midst of scars may convey a life that has learned to cope with life’s hard knocks. I am not in any way suggesting here that we wear a false front or try to create an impression that is not true. If we are to be honest and authentic, the package we present to the world will grow out of our everyday life experience. It is the way we choose to deal with that experience, however, that shows in our countenance. Do we convey the image of a gnarled and rocky spiritual landscape, one that is hostile and uninviting? Or does our image suggest that our life experience, whether difficult or easy, is being nourished by the life enriching stream of God’s generous grace? Does the personal dust-jacket we wear suggest that we have a positive and wonderful message we are happy to share with others? Or do we convey a closed or hostile image? The jacket we wear may well make all the difference in determining whether or not we get to share the Peace of Jesus Christ with someone today. May your personal dust jacket reflect life and grace today, both for you and those whose lives you touch. Another book I love and that I've read at least three times in that slow, few pages at a time, read and reflect kind of pace is There is a Season. It's a memoir by poet Patrick Lane. I believe at this moment I own three copies and I know I have given away more than one. It doesn't have a removable book-jacket. It's a paper cover, a dogwood flower hooked by fish hooks--a very intriguing image. It is a story of healing and I love that book very much. There, now you have two recommendations for your meditative, reflective, healing work, all you who need them. I bought that book in the summer and have not yet read it. It's in my pile of books I'm collecting for my Florida reading. Might have to start it sooner. The dust cover is lovely and so it the metaphor. I'll be thinking about my dust jacket and what it reflects.